Denying the Earth changes caused by Nibiru has been the norm, for over a decade. This includes reducing earthquake magnitude and dropping quakes from the databases so statistically, matters look normal. 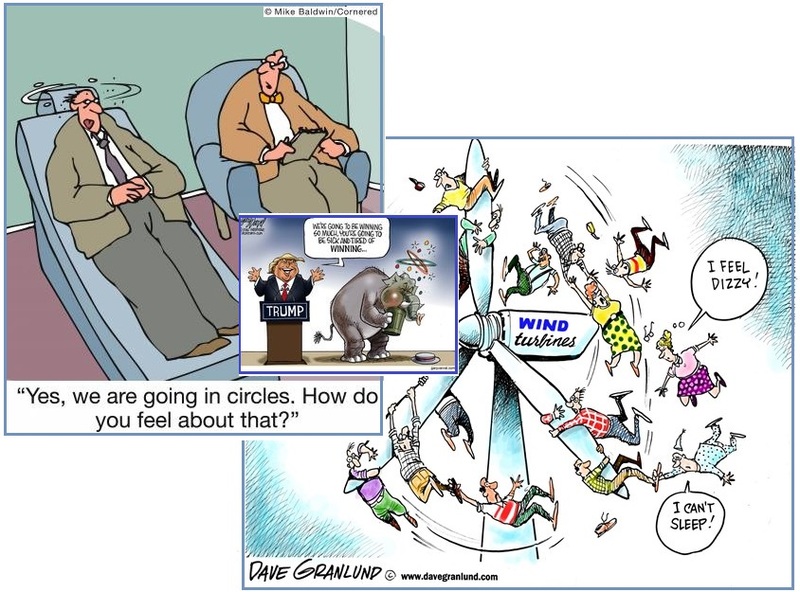 Live seismographs have been desensitized, ocean buoys taken off line and deactivated for no reason, and magnetosphere modeling sites which focused on the flow of magnetons taken offline and replaced with modeling sites focusing on solar emissions. These trends have not changed, despite the increase in Nibiru assaults against the Earth. Buoys are turned off, for no reason, in the most seismically active parts of the globe. The S America Roll and the Africa Roll are in process, thus the region of the S Atlantic would be showing this activity. Because Nibiru is still denied, sloshing water in the S Atlantic is to likewise be denied. No buoys are active there! There is also the constantly active region just to the east of Japan, and extending down past the Philippine and Mariana Plates. Since any compression of the Pacific is to be denied, these buoys are likewise inactive. What happened to the need to inform ships at sea about potentially high waves and the populace along the coastlines of tsunami dangers? 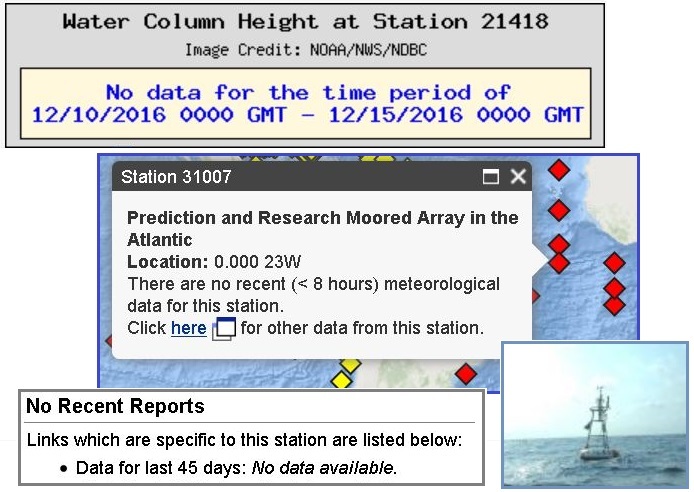 A recent alarm about the tallest wave ever recorded by a buoy stresses that importance. The Zetas warned in 1997 that these giant waves would be on the increase as the Pole Shift approached. And they have. The UN's weather agency on Tuesday announced the highest wave on record - a behemoth that towered 19 metres (62.3 feet) above the North Atlantic. 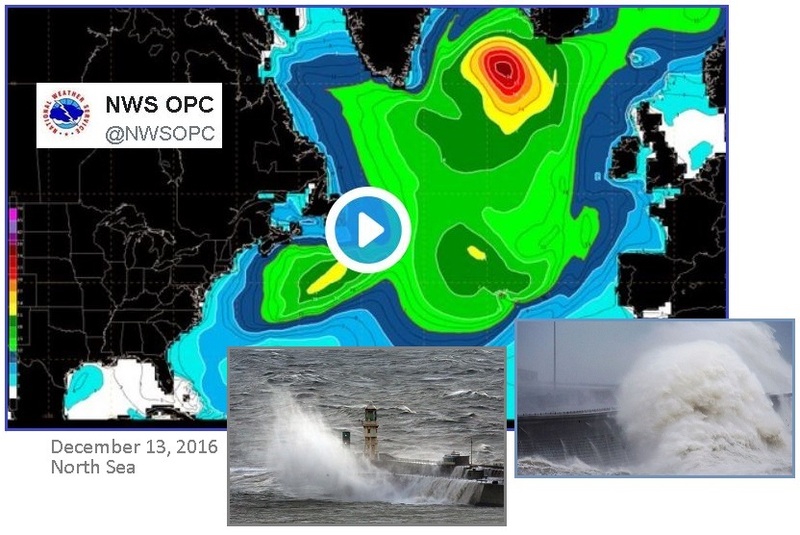 Scrutiny of data sent back by an automated buoy showed a monster wave rose at 0600 GMT on February 4, 2013 at a remote spot between Britain and Iceland. Automated buoys are vital tools for oceanographers, sending back data on sea currents, temperatures and swells for seafarers, climate researchers and others. Waves in the open sea are measured from the crest of one wave to the trough of the next. The area between Iceland and the UK produces large waves because of the wind patterns in the area, which create "intense extra-tropical storms" or "bombs," according to the WMO. The winds at the time of the wave were around 50.4 miles per hour. This wave beat the previous record-holder of 59.96 feet, which was also set in the North Atlantic, back in 2007. ZetaTalk Warning 6/15/1997: The increasing activity in the core of the Earth will eventually manifest itself in ways that will become difficult to explain. Erratic weather will continue to be explained away as global warming, the result of the atmosphere heating up to cause swirls in the upper atmosphere. Violent wave action that swamps large ocean going ships and the booms from clapping air caused by underwater plate movements will be lumped in with earthquake activity. The increasing incidence of earthquakes will be explained as periodic cycles, with ancient legends to support the cycle theory, or improved reporting mechanisms, implying that quakes were not recording in the past. The dramatic flashes of light caused by methane gas flares as the gas is released from trapped pockets under moving plates will be explained away as lightning. The increasing magnetic diffusion will be blamed on sun spot activity, as neither is readily measurable to the average man so the story will not often be challenged. European satellites have given confirmation to terrified mariners who describe seeing freak waves as tall as 10-storey buildings. "Rogue waves" have been the anecdotal cause behind scores of sinkings of vessels as large as container ships and supertankers over the past two decades. But evidence to support this has been sketchy, and many marine scientists have clung to statistical models that say monstrous deviations from the normal sea state only occur once every thousand years. Testing this promise, ESA tasked two of its Earth-scanning satellites, ERS-1 and ERS-2, to monitor the oceans with their radar. The satellites identified more than 10 individual giant waves around the globe that measured more than 25 metres (81.25 feet) in height. In 1995, the British cruise liner Queen Elizabeth II encountered a 29-metre (94.25-feet) wall of water during a hurricane in the North Atlantic. Its captain, Ronald Warwick, likened it to "the White Cliffs of Dover." A British research team has observed some of the biggest sea swells ever measured. Near the island of Rockall, 250 kilometers (155 miles) west of Scotland, the Discovery's crew witnessed the largest waves ever measured by a scientific instrument on the open sea, according to an article the scientists have only now published in the journal Geophysical Research Letters. With a height of up to 29.1 meters (95 feet) from trough to crest, the single waves are the highest ever measured. 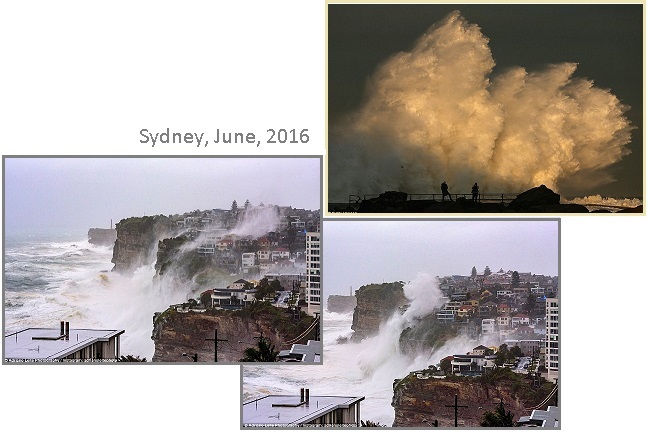 The largest wave ever recorded in New South Wales was measured earlier this week during violent storms that lashed Australia's east coast - smashing the previous record by several metres. What is a Gamma Ray Burst? Apparently, the Earth receives radiation from such a burst daily. It causes UV in a focal location to raise, briefly, followed by a rise in ozone at that local spot, and then perhaps more nitrates in the rain at that location, but overall, extremely minor and not a threat to life. The immediate effect on life on Earth from a GRB within a few parsecs would only be a short increase in ultraviolet radiation at ground level, lasting from less than a second to tens of seconds. The long term effects from a nearby burst are more dangerous. Gamma rays cause chemical reactions in the atmosphere involving oxygen and nitrogen molecules, creating first nitrogen oxide then nitrogen dioxide gas. The nitrogen oxides cause dangerous effects on three levels. First, they deplete ozone, with models showing a possible global reduction of 25-35%, with as much as 75% in certain locations, an effect that would last for years. This reduction is enough to cause a dangerously elevated UV index at the surface. Secondly, the nitrogen oxides cause photochemical smog, which darkens the sky and blocks out parts of the sunlight spectrum. This would affect photosynthesis, but models show only about a 1% reduction of the total sunlight spectrum, lasting a few years. However, the smog could potentially cause a cooling effect on Earth's climate, producing a "cosmic winter" (similar to an impact winter, but without an impact), but only if it occurs simultaneously with a global climate instability. Thirdly, the elevated nitrogen levels in the atmosphere would wash out and produce nitric acid rain. Nitric acid is toxic to a variety of organisms, including amphibian life, but models show that it cannot reach levels that would cause a serious global effect. The nitrates might in fact be of benefit to some plants. GRBs close enough to affect life in some way might occur once every five million years or so – around a thousand times since life on Earth began. So why all the hoopla about a GRB coming on December 26, 2016? Is this of interest to anyone but astronomers? Would the common man even notice? This has been a known GRB since July, 2015, but is just now a big deal? The Zetas explain. It is part of the Nibiru denial, and is getting this press because Hillary, a Nibiru cover-up supporter, lost the 2016 election. Videos have emerged claiming a GRB was responsible for the huge 2004 magnitude 9+ earthquake in Ache! This despite the fact that the GRB arrived after the earthquake. Earthquake on December 26, 2004, radiation arrives on December 27, 2016. The proponents also claim that all the Earth changes since 2004 have been due to such bombardment from outer space. Meanwhile, Nibiru is not mentioned. Every couple of decades the black hole fires up in an outburst of high-energy light. Its previous eruption ended in 1989. The investigating team includes scientists from the Universities of Leicester, Southampton, and Oxford in the U.K., the University of Alberta in Canada, and the European Space Agency in Spain. The Swift X-ray image of V404 Cygni covers a patch of the sky equal to about half the apparent diameter of the full moon. This image shows the rings as they appeared on June 30. V404 Cyg, an X-ray nova and a low mass X-ray binary (LMXB) with black hole component, is undergoing its first reported X-ray and optical outburst since 1989. 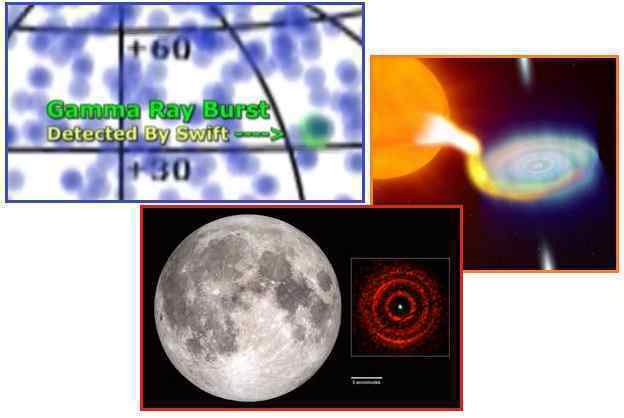 Large scale, rapid variations are being reported in wavelengths from X-ray to radio by professional and amateur astronomers worldwide. After taking a 26-year nap, a waking black hole released a burst of X-rays that lit up astronomical observatories on June 15 — and it's still making a ruckus today. The system was caught fluctuating in visible light in 1938 and 1956, and then in X-rays in 1989. ZetaTalk Insight 12/17/2016: Of course a Gamma Ray event did not cause the 2004 Ache earthquake, as the Gamma Rays were received long after the earthquake. Nor have such light shows caused any impact on Earth in the past. Distant Gamma Ray bursts are recorded daily by Earth satellites. They are common! The theoretical impact where such an outburst is received on the surface of the Earth is a slight increase in UV, lasting less than a second. This is hypothesized to decrease Ozone at the point of impact also, reducing sunlight received by 1% in that locale. There are also beneficial results from an increase in nitrates in rain. All in all, a Gamma Ray event is nothing more than a light show for astronomers, the man on the street and life on Earth blissfully unaware that it is going on. So why the fuss? Why the attempt by some to attach a cause and effect to a Gamma Ray event in 2004 to the huge Ache earthquake? 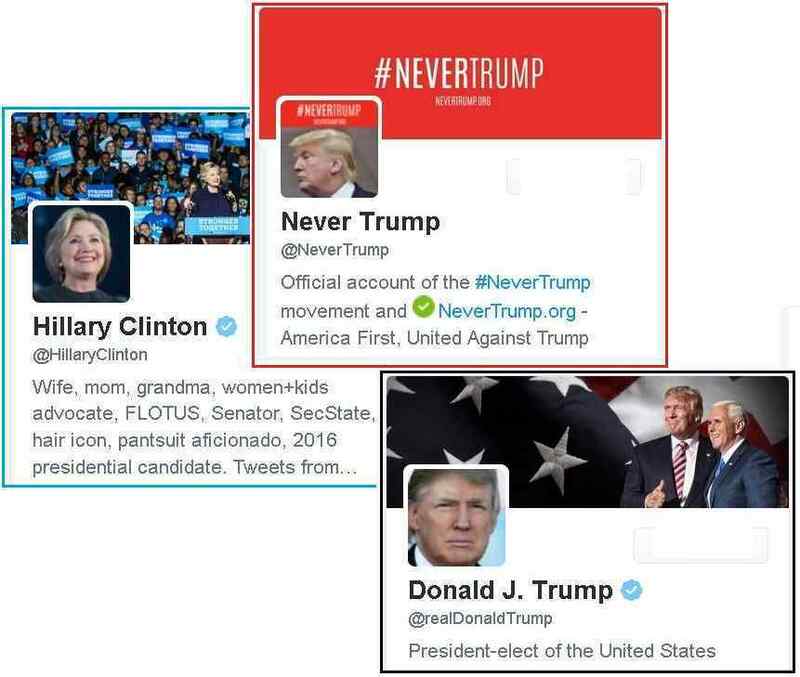 Just as the #NeverTrump crowd is alive and well, trying to breathe life into #HillaryClinton, just so the #NeverNibiru crowd will not die easily. They will now claim that any new earthquakes are due to this December 26, 2016 Gamma Ray event. Based on the fervent effort to provide alternative reasons for the Earth changes, we can presume that the truth about Nibiru is about to burst forth. 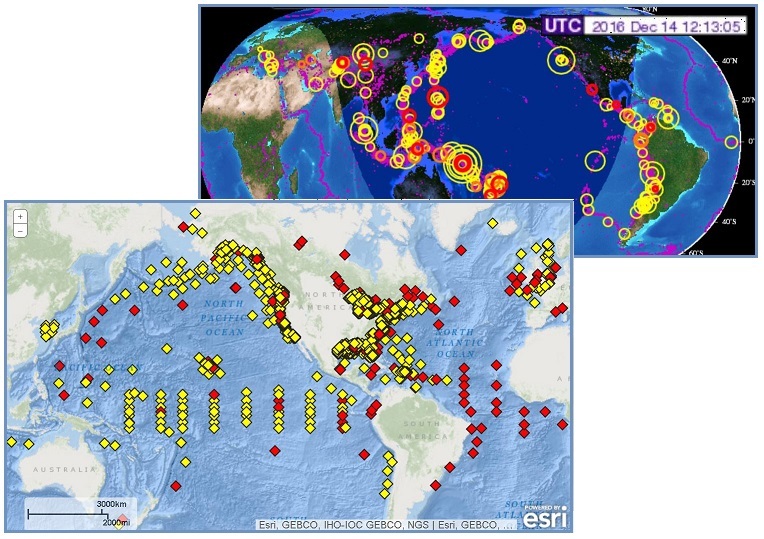 Earthquakes have been increasing in magnitude and frequency lately, and despite the reduction in published and admitted magnitude by more than two full magnitude points, and despite the tsunami buoys being desensitized or turned off, and despite the live seismographs being so desensitized they are practically dead – the public is becoming aware that the plates are moving. Cracks appear, water mains burst, bridges and buildings drop, yet all are ignored or denied. The elite have much to gain from the cover-up over Nibiru continuing. Their reasons for starting the cover-up have not changed. They want life as it is today to continue as long as possible. They fear the common man becoming aware, and making demands for their safety too. Will they form mobs and try to invade the enclaves of the wealthy? By denying Nibiru until the last minute, they hope to block escape routes, shut off electricity and water to the masses, and kill off as many of the common man as possible in the violence of the Pole Shift. The alternative explanations for Nibiru will thus increase in step with the awakening to Nibiru’s presence. 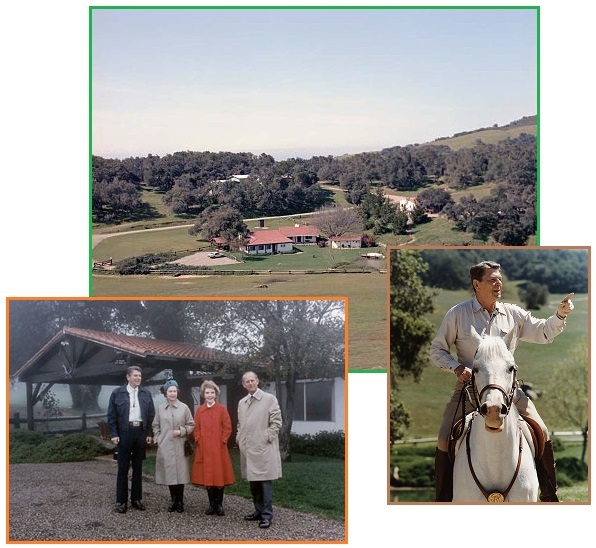 If Crawford Ranch was Bush’s Western White House, and Rancho del Cielo was the Western White House for Reagan, is New York City to be considered the Northern White House for Trump? 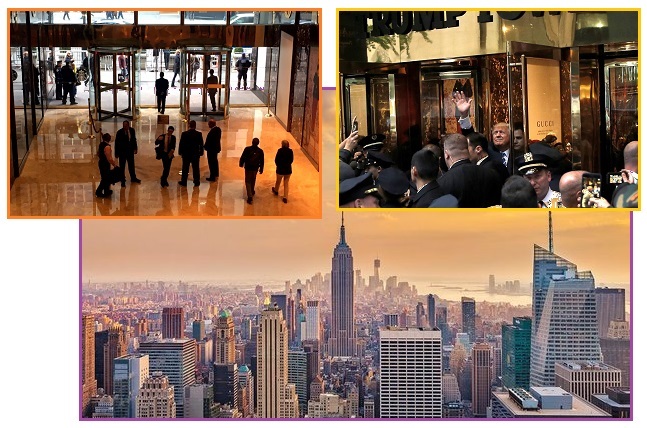 New York City, crowded and home to 8.4 people and visited by many international visitors, is hardly an ideal place to secure a President. It is a Secret Service nightmare. The property was acquired by George W. Bush in 1999 and was known as the Western White House during his presidency. 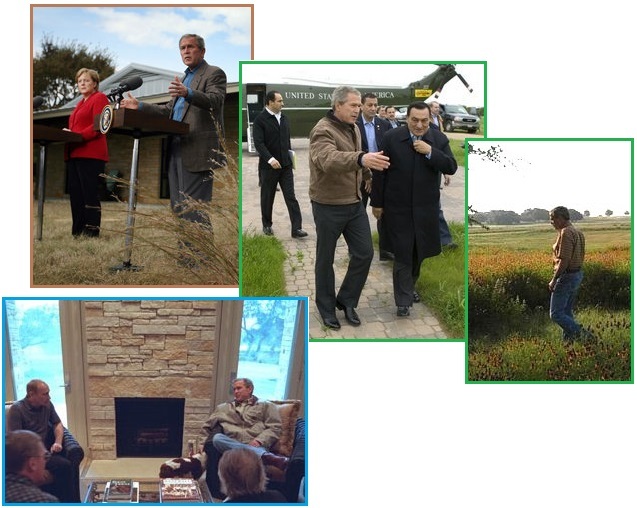 Bush spends vacation time at the house where he has also entertained dignitaries from around the world. Rancho del Cielo served as a vacation home for President Ronald Reagan and First Lady Nancy Reagan. Reagan spent vacations during his presidency at the ranch, which became known as the Western White House. He signed the Economic Recovery Tax Act of 1981 at the ranch and at various times hosted British Prime Minister Margaret Thatcher, Queen Elizabeth II and Soviet leader Mikhail Gorbachev. So it should be no surprise that a New York National Guard C-130 surveillance and/or search and rescue plane was seen circling the area. 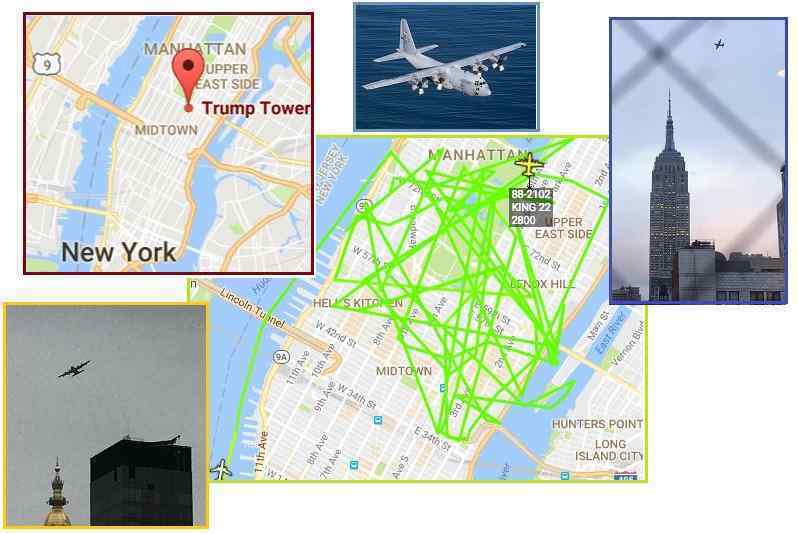 The plane flew low, and crossed the area where Trump Tower is located multiple times. It was called a training operation, but little else was learned from the National Guard. But the Zetas explain. Residents of New York City were asking lots of questions as a C-130 military plane belonging to the New York Air National Guard flew around the city late Tuesday afternoon. Reports indicated that it circled midtown for about an hour before leaving the airspace. … the Air Mobility Command says they'll get back to us … I am on the 60th floor of the Empire State Building and it has circled closer than anything I have seen … Seeing multiple reports of a USAF C-130 and several Black Hawk helicopters circling low (3,000 feet) over Manhattan. No, that is not normal … The C-130 belongs to the 102nd Rescue Squadron of the New York Air National Guard. … USAF aircraft callsign “KING” listed as “SAR (search and rescue) aircraft not on mission. … I'm willing to bet it was a training exercise on what they'd need to do to scoop POTUS from NYC. Capable of using unprepared runways for takeoffs and landings, the C-130 was originally designed as a troop, medevac, and cargo transport aircraft. The versatile airframe has found uses in a variety of other roles, including as a gunship (AC-130), for airborne assault, search and rescue, scientific research support, weather reconnaissance, aerial refueling, maritime patrol, and aerial firefighting. It is now the main tactical airlifter for many military forces worldwide. ZetaTalk Confirmation 12/17/2016: This was not standard surveillance. Helicopters are more mobile, and can drop lower than a C-130. This C-130 was loaded with special equipment to do electronic surveillance, ie chatter done by would-be terrorists. It is not just chatter, and the source of the chatter, that can be located, but also any radioactive material. Yes, this is related to protecting the President Elect – Trump – at home in Trump Towers. The Secret Service and Department of Defense will be relieved to see Trump move to more defensible residences, like the White House. Being dizzy and being nauseous go together, so when humans get struck by a bout of magnetic sickness, it is logical that both symptoms would be present. What is magnetic sickness? The vast tail of Nibiru is charged, as it is composed primarily of iron oxide dust gathered from its many passages through the Asteroid Belt. The iron oxide dust was attracted to that big magnet – Nibiru – and trailed along after it. Thus, the vast magnetically charged tail of red dust. This issue came up on Internet forums in 2007, and the symptoms have not changed. I casually mentioned to a couple other co-workers that I had felt like I was going to pass out, and they both said they had felt the same way. They describe the same sensation I had experienced as more of a "woozy" or faint/pass out feeling than dizzy. [and from another] I`m an archeologist and I`m working in a remote place in the middle of Argentina. I had to stop doing my research cause I`ve been feeling exactly as you described. I went to the hospital but nobody knew anything. [and from another] I stayed with my Mother-out-law for a few days after Christmas. She lives by the sea in Wales. We all had the wurlies whilst we were there. [and from another] Just recently a friend of mine starting experiencing vertigo, she went to the doctors thinking it was an ear infection..Nope, Nada. We went to the movies and she got dizzy going up the stairs [and from another] I actually went to the hospital for this about 2 weeks ago. I basically felt, as far as balance, that I was walking around drunk. That's how off balance I was. When I went to the hospital they had no clue what it was. They took blood and checked my brain. Nothing. [and from another] My wife has been experiencing abnormalities with her monthly cycles as well, namely in that they are more frequent. She has had tests run and exams at her gynecologist, but everything is normal. Magnetic sickness was featured in this newsletter on January 28, 2007 and again on January 4, 2015 when the Sleepy Hollow affliction in Kazakhstan was featured. Now, coincidentally in another January, magnetic sickness seems to be striking again. Many people, particularly on the N American continent and in Europe, are suddenly reporting bouts of dizziness and nausea. Per the Zetas, this will not kill you, but will come and go and is also unlikely to go away until after the passage. ZetaTalk Comment 1/6/2007: There is more than red dust and debris that comes with the tail, as there are unseen elements. Add to the effects of the tail elements filtering through the atmosphere, the magnetic swings. It is more than magnetic particles that are affected, when the swings are violent, as they have become. These matters will not go away, but will increase up to the pole shift, when relief will at last be at hand.